Powers review: PlayStation Network’s clunky take on prestige superhero TV. This superhero police procedural is the PlayStation Network’s clunky take on prestige TV. 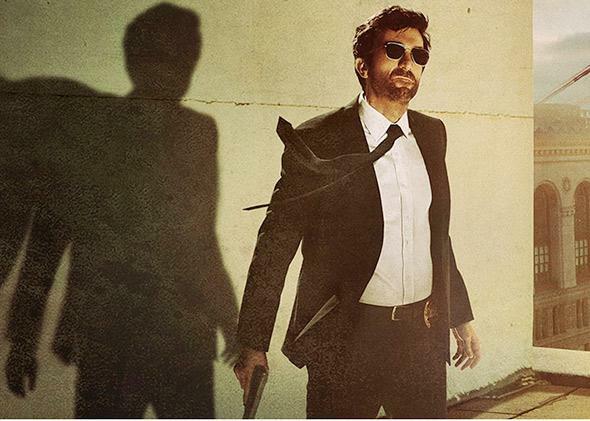 Sharlto Copley plays former superhero Christian Walker in Powers. Premiering Tuesday, Powers is the first scripted show on the PlayStation Network, the gaming console’s (and Sony Pictures’) entry into the crowded field of glossy, scripted, streaming TV, not to mention the crowded field of moody masks-and-tights adaptations. (It’s based on a long-running comic series by writer Brian Michael Bendis and artist Michael Avon Oeming.) Like Fox’s Gotham, which is set in the pre-Batman days of Gotham City, Powers is ostensibly a police procedural with some superhero trappings. But in this universe, puny-human cops sometimes have to cuff criminals who can absorb the properties of concrete or channel electricity, and who rarely go quietly. Heroes—some of whom pop power-enhancing party drugs like Sway and accept blow jobs from “wannabes” hoping to get a dose of their powers—can’t always be counted on for tactical support. That’s the question this kind of story is meant to ask, but it’s been answered more edifyingly elsewhere. Comics writers often present supervillains as superheroes’ clarifying foils, thematic opposites that expose the genre’s contradictions: Batman has to defeat the Joker, but his existence also makes the Joker possible. The more interesting, and less exploited, relationship is superhero and cop. Superhero stories are comfort fiction, but when police—fallible, relatable, taxpayer-funded, and responsible for cleaning up the superheroic damage—get involved, we begin to get uncomfortable. No wonder some of the best, most interestingly complicated Batman stories are about Commissioner Gordon. The excellent Gotham Central—a comic series that ran for 40 issues in the 2000s and followed police detectives going about their daily business in Batman’s city—understood that dynamic. Issue by issue, case by street-level case, it prodded the idioms, hypocrisies, absurdities, and staying power of our superhero myths. Something kind of similar is happening in the fleeter, more escapist Arrow and The Flash, two ongoing series on the CW based on DC Comics characters. Both shows’ casts include detectives whose occasional struggles with the morality of abetting souped-up vigilantes undergird the title characters’ own exploits. But a truly deconstructionist superhero story, in the form of a slowly unfolding procedural, with a side helping of zaniness? I would have liked to see that show. Powers isn’t it. What Powers is, from the start, is something stranger, more convoluted, and a bit grandiose (at least in the three episodes shared with critics). Early on, Walker is paired with Pilgrim, and soon they’re investigating the lurid death of Olympia, an aging hero who’s discovered with an exploded heart and something funny-looking in his blood. A few feet away is a shaken-up Calista (Olesya Rulin), a homeless, underage wannabe who, the audience learns, appears to have fallen in with a supercharged drug ring led by Johnny Royalle (Noah Taylor), a teleporter with skinny slacks and a taste for soliloquy. Possessing a clue to all of this may be Wolfe, now a federal prisoner who’s so dangerous his keepers have lodged a poker in his brain. And complicating it all further is Walker’s ex-girlfriend, the superheroine Retro Girl (Michelle Forbes), who, when not cleaning up humanitarian crises, is flexing her power in nightclub VIP sections. The show does offer up some craftier digs at the genre’s guiding myths. Take the medical examiner Dr. Death, who hates investigating superhero homicides because those pesky powers defy known science. (Powers could use more humorous moments in this vein.) Or consider the heated moment in a nightclub that boils over when Retro Girl, approached by a wannabe, shoves the young woman away and yells, “Stop touching me and grabbing me!” Paparazzi cameras and the crowd’s smartphones capture the exchange, and Retro Girl, having initially arrived to deliver a message about strength, instead walks away, bested not by an opponent’s talents but her own PR blunder. Image-making, not ability—now that’s power.